April 30, 2017 April 18, 2019 - The 'Noms. Boozy homemade marshmallows with some added chocolate! Being cocktail bloggers, we are used to being sent samples of different spirits and alcoholic products to try, but rarely do our friends hand us a bottle and ask us to do something with it! We have a friend who loves all kinds of flavored vodkas, but she had one flavor that she couldn’t figure out what to do with it, Cookie Dough Vodka. With no idea what to do with it other than shots, she turned to us to see if we could do anything with it! We played around a bit with the cookie dough vodka to make her a cocktail she could enjoy, but we kept coming back to using it for some kind of boozy dessert. Since the Cookie Dough Vodka was really sweet and chocolatey, we figured it might be good in something sweet like homemade marshmallows! 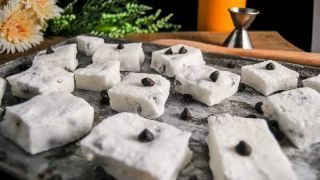 We have had a good luck making boozy marshmallows in the past with a delectable Peppermint Mocha Marshmallow and a delicious Cherry Amaretto Marshmallow so why not try to make a chocolate chip one? These boozy marshmallows were a big hit with us and our friends (and our readers!) 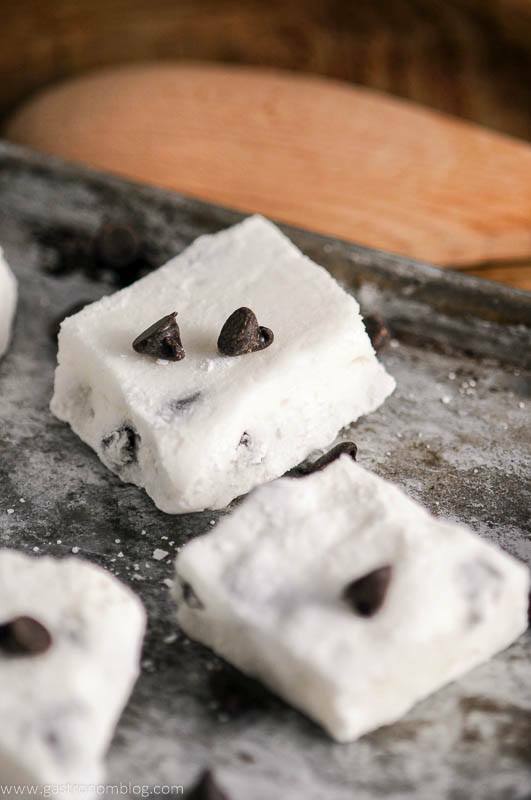 so we decided to see if we could make Chocolate Chip Boozy Homemade Marshmallows! The sweet fluffy marshmallow lends itself to picking up other great dessert flavors like chocolate. We added a couple of ounces of the Cookie Dough vodka to our marshmallow mix and suddenly the spirit that we had trouble figuring out how to use became a perfect part of a marshmallow! 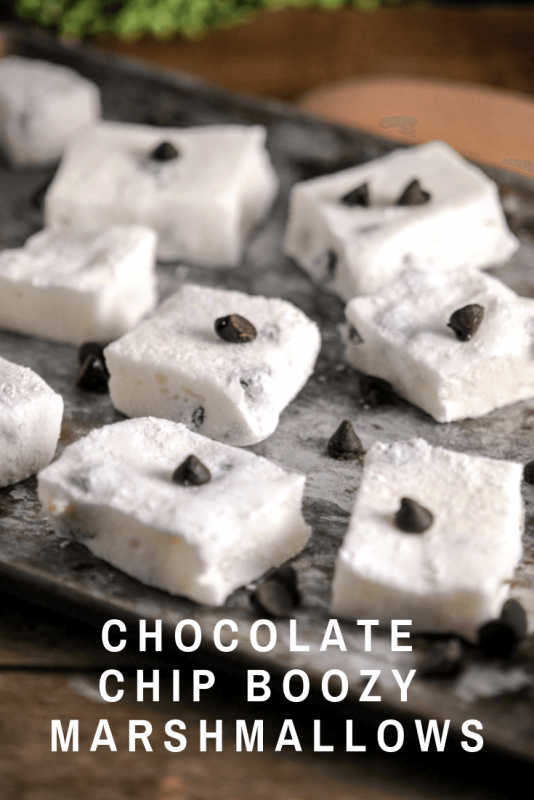 What Ingredients are Needed for the Chocolate Chip Booze Marshmallows? Of course any chocolate chip boozy marshmallow needed to have some actual chocolate chips in it! With the cookie dough vodka definitely having a chocolate chip cookie flavor it was only natural to add some chocolate chips to really pop the chocolate cookie dough favor. We folded in some chocolate chips before the marshmallows set up, which added a nice chunky bite of chocolate to the fluffy marshmallow. The chocolate chip hidden inside almost are like a little treat treasure in there! 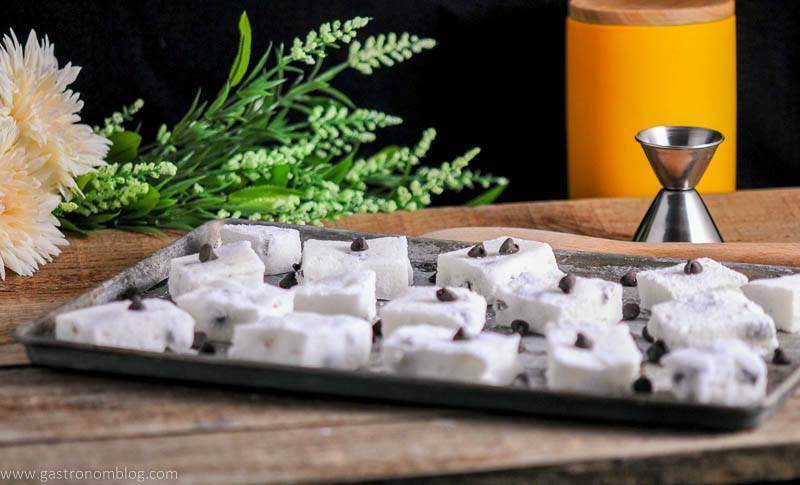 Everyone who has tasted these Chocolate Chip Boozy Homemade Marshmallows loved them, sweet and fluffy with a nice chocolate crunch and a hint of fresh chocolate chip cookies! 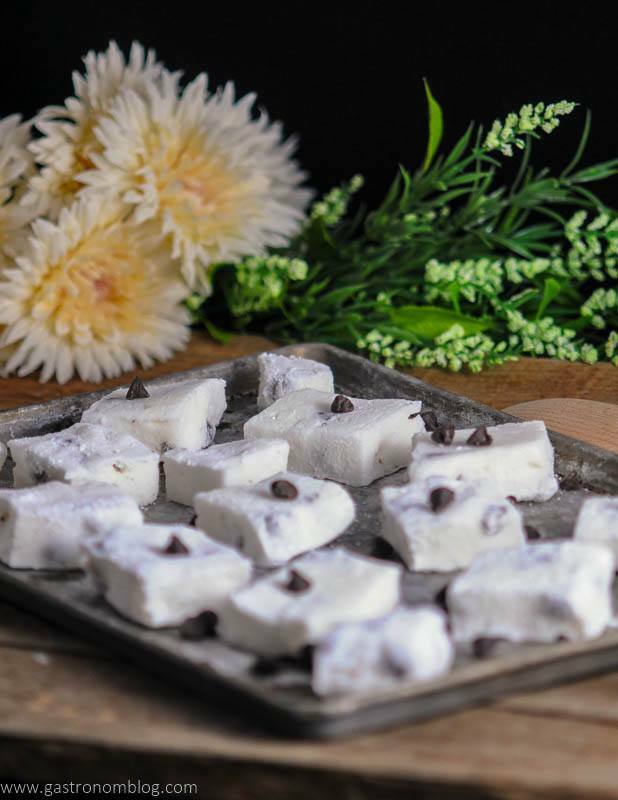 Give these boozy marshmallows a try and you will find them a fine sweet boozy treat! 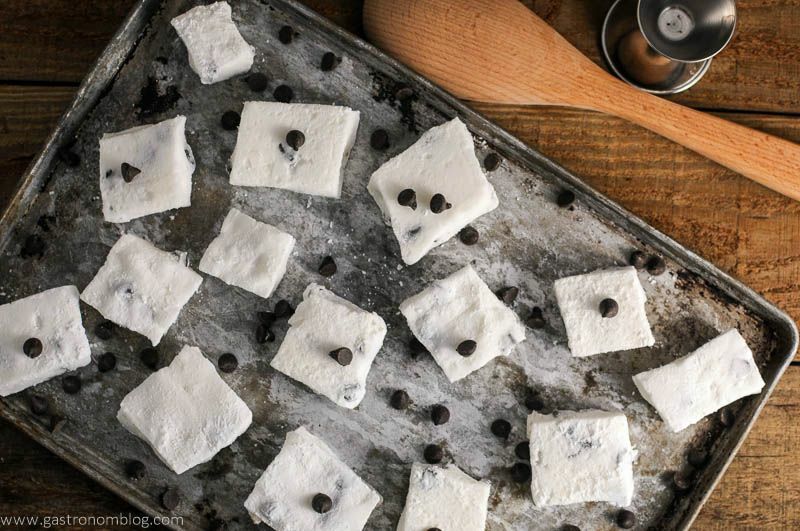 Boozy marshmallows with chocolate chips added. Perfect for hot chocolate. This recipe is easier with a stand mixer, but you can do it with a hand mixer. You can use an 8x8 pan for thicker marshmallows or a 9x13 for thinner. 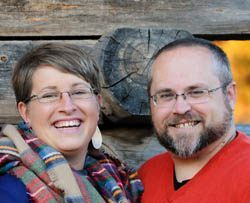 We split the difference at an 8x11. Place water in the mixing bowl with the whisk attachment. Sprinkle gelatin on top. Let bloom while you are doing the next steps. Spray sides and bottom of pan with cooking spray. In a small bowl, combine powdered sugar and cornstarch. Coat the greased pan with the sugar/cornstarch mixture, making sure to cover the sides and bottom. Don't use it all, set the extra aside for later. In a small saucepan, mix together 1 Tbsp vodka, sugar, corn syrup, water and salt. Stir continuously, making sure to not boil over, until the mixture reaches 238 degrees. Add the remaining vodka and the Kahlua into the mixing bowl with the gelatin. Then slowly add the sugar syrup. Once gelatin is dissolved, set mixer on high, Whip for at least 15 minutes, ours took 19-20. The mixture is ready once it has doubled in size and is thick enough to to have peaks in the batter. Add the chocolate chips to the mix, folding it into the marshmallow mix. When ready to cut, dust a pizza cutter or sharp knife with more sugar/cornstarch mixture. Then slice to the size you want. Remove the marshmallows from the pan and toss in the last of the sugar/cornstarch mixture so the sides aren't sticky. Store in an airtight container. PIN THESE CHOCOLATE CHIP BOOZY MARSHMALLOWS RECIPE FOR LATER! Boozy marshmallows? I can think of so many ways to use them! Perfect for grown-ups drinks in the winter! They are so good! Hope you try them out! Yes, so much yes! Enjoy! Have keep these up high away from the kids. Great idea. Uh, yes please! the name alone is all things I love!!! 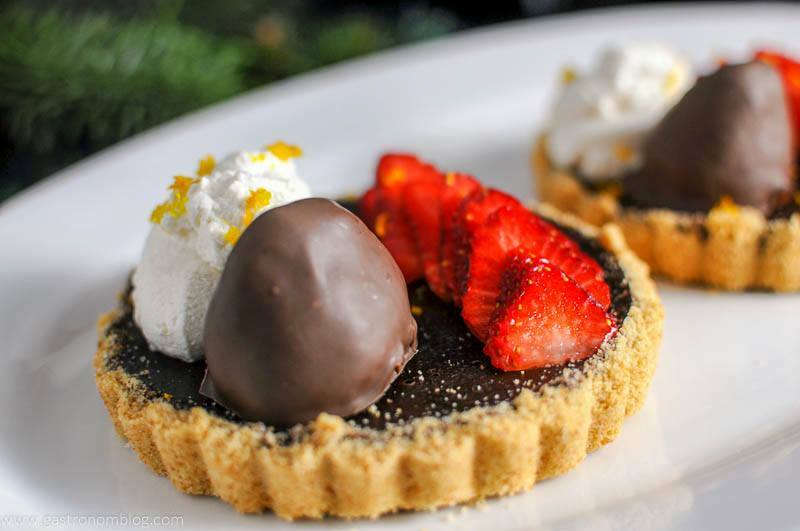 i think i would really love any kind of boozy dessert! i love it when there’s liquor in chocolate so i think i’m the perfect candidate for this! It’s pretty tasty! Thank you! Great idea! What a fun way to use a special vodka! This is such a fun, delicious, idea! I can’t wait to try these out at my next summer BBQ or bring them as a hostess gift when I’m invited somewhere. Thanks for sharing! Thanks! It would be so fun for a gift! Enjoy! These sound amazing! I’m a huge marshmallow lover so these are going on my must make list soon. YUM! Thanks, they are so good! Enjoy! 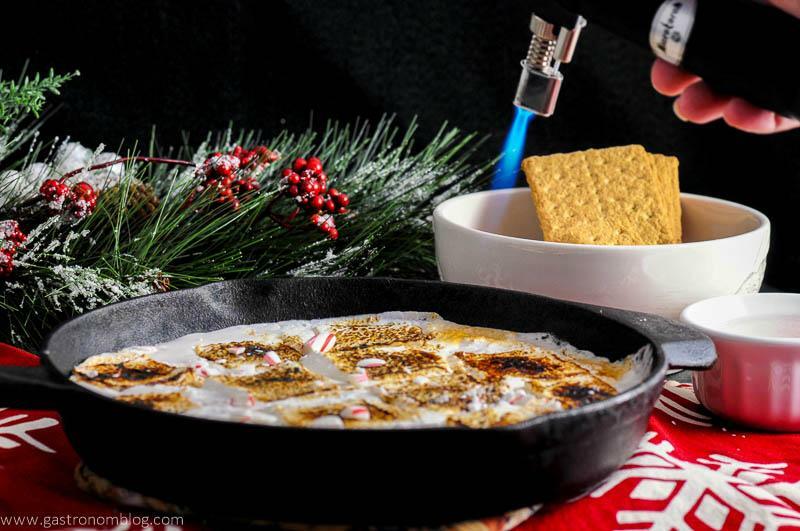 Your boozy marshmallow recipes are so fun! Someday, I’m going to break down and make some. This one sounds really good. I had no idea there was such a thing s cookie dough flavored vodka. Thanks so much, we hope you try it out! We didn’t know about the vodka either til we had to try it out, haha! OH my gosh I am drooling over these marshmallows! Need to try this recipe idea–thanks! Hope you try it out! Enjoy! Haha, thanks! They are pretty tasty! Love it. Definitely will do ! Thank you so much !